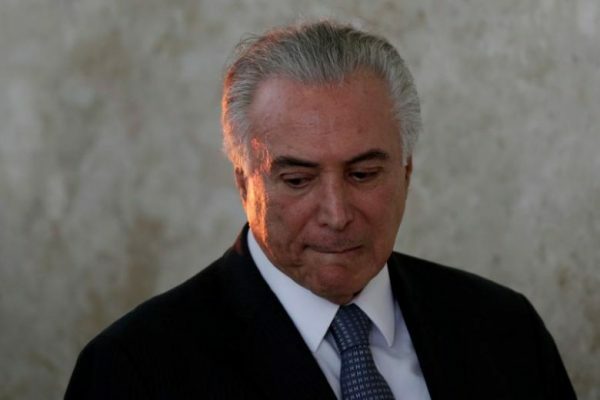 Brazil’s ex-President Michel Temer was arrested Thursday in an investigation of alleged graft in the construction of nuclear plant Angra 3, prosecutors told Reuters, rattling the political class and threatening to delay a major pension reform. Temer was president from 2016 to 2018, taking office following the impeachment of Dilma Rousseff, for whom he served as vice president for six years. His lawyer confirmed the arrest. Brazil’s currency slipped as much as 1 percent on the news and the Bovespa stock index fell 1.5 percent, as the prospect of new arrests of prominent politicians threatened to delay debate over sweeping economic reforms. Temer, a longtime legislator, was hit with corruption charges during his presidency which were blocked by allies in the lower house Congress. The legislative body must authorise charges against a sitting president.